Brand new 15x7 Baja Style Slotted Wheel. 5 on 5.5 Lug Pattern, 15 inch diameter. 3.75" backspacing. 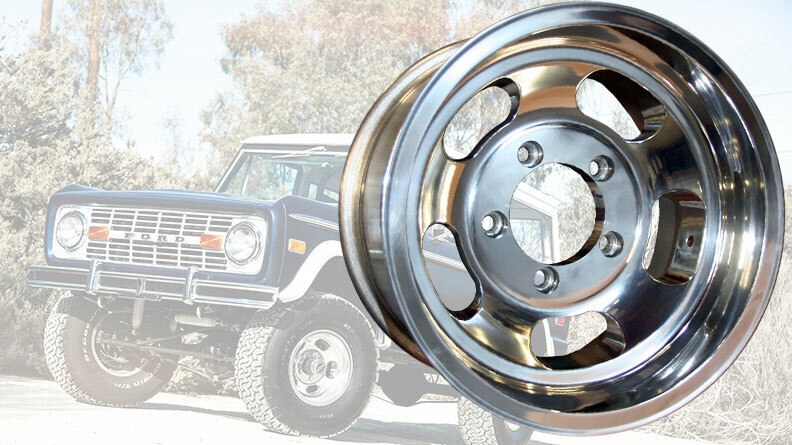 NOTE: Due to the backspacing of these wheels, these will not clear a Stock height Bronco with uncut fenders. If your fenders are cut, these will fit with no problem. May require wheel spacers for Rear Disc Brake Kits. Diameter of center hole is 4 1/4". If you need lug nuts as well, they are available below! NOTE: 1976-1977 Broncos with factory disc brake knuckles AND/OR Broncos with F-150 disc brake conversions MAY require 1/4" spacers to clear the steering linkage where it attaches to the knuckle. We are finding that some of the aftermarket replacement tie rods have larger diameter ball joint ends that can interfere with the wheel.